When you think back on shocking moments in sport, the moment Harald 'Toni' Schumacher made himself a household name probably comes to mind fairly quickly. It was not just about what he did, it was also because it was a World Cup semi-final between two major footballing nations. There are not many bigger stages he could have chosen to make sure he will forever be remembered as a villain. What makes Schumacher particularly remarkable is that he managed to make himself a villain twice, the second time within German football itself. Schumacher was born in 1954 in Duren, West Germany and his path to the professional game was littered with disappointments as a youngster. Trial after trial saw him rejected as not good enough, which is credited for giving him his obsessive desire to win. He never gave up his dream and eventually was signed up by Koln, where he made his first team debut at the age of 19. There he made himself a regular, making 213 consecutive Bundesliga appearances for Koln between 1972 and 1987, winning the double in 1978 and the German cup twice more in 1977 and 1983. He also established himself as first choice for Germany and became considered one of the best in the world. His reputation was so high that Schumacher was twice named West German football of the year and was in goal for the West German triumph in the 1980 European Championships. Going into the 1982 World Cup, in Spain, as European champions put the West Germans amongst the favourites. France, with the great Michel Platini as the central figure, were also favoured heavily. However both got off to a rough start, with the French sending home Pablo Larios for, allegedly, having an affair with Platini's wife and losing the opening game to England. The West Germans also lost their opening game to Algeria, then conspired with Austria to play out a draw to ensure they both got through and the dangerous Algerian team went home. That is why the World Cup now has the final group stage games played simultaneously to stop that kind of cheating happening again. The pair got through to the semi-finals in Seville, but the Germans were hit by a stomach virus which affected several of the Germans' key players. Added to that reigning European Player of the Year Karl-Heinz Rummenigge had suffered a knee injury and was nowhere near fully fit. He was left out to rest. The semi-final kicked off in sweltering heat at 9pm in Sevilla and the West Germans took the initiative in the opening minutes. Pierre Littbarski hit the bar with a 25 yard free kick before, in the 17th minute, he latched on to a rebound and hit the ball through a crowd of players to open the scoring. The French came back into it and, ten minutes later, Dominique Rocheteau was brought down in the box by Bernd Forster and Platini stepped up to slot the penalty away and level the score. Schumacher twice got away with challenges on Didier Six and Manuel Amoros before the half-time whistle, showing the aggressive style he was known for which had seen him break 8 of his fingers during his career. The second half began and, in the 50th minute, France made their first of two substitutions allowed by the rules in those days, bringing off Bernard Genghini and replacing him with Patrick Battiston. Just ten minutes later French left-back Maxime Bossis takes the ball off Wolfgang Dremmler and lays it off to Platini who looks up and plays a through ball to Battiston. "The pitch was like a corridor and there was nobody in it, like the Champs-Elysee at five o'clock in the morning," Battiston later recalled. The French sub races towards the ball as Schumacher comes racing out of goal trying to beat him to the ball. Battiston gets to it first and flicks it past Schumacher before the German keeper barrels into him, jumping right at the Frenchman, to crash into him with his hip smashing Battiston full in the face. Schumacher claims to this day that the contact was unintentional, but I doubt anyone has ever believed him as the footage is damning. Battiston was knocked unconscious, needing 7 minutes of treatment on the pitch, including oxygen, and later went into a coma. Two teeth were lost, 3 ribs were cracked and he cracked a vertebrae in the impact. Michel Platini later said that he thought Battiston had died because "he had no pulse and looked pale". To everyone's (and I do mean everyone's) surprise, shock even, referee Charles Corver did not award a red card. In fact he did not even see fit to give a free kick, instead a goal kick was to restart the play once Battiston's treatment was done. Schumacher seemed unconcerned while he waited, ball juggling, passing the ball with a team mate or just standing around looking bored while he waited. The French were forced to use their last sub, something which could possibly have been key as they tired in extra time, after taking a 3-1 lead, allowing the West Germans to bring it back level, despite the Seville crowd being fully behind the French now and cheering every successful French pass. With Schumacher's every move subjected to boos and whistles from the crowd, the game was taken into the World Cup's first ever penalty shootout. The French won the toss and shot first with Alain Giresse stepping up to send Schumacher the wrong way, to the delight of all watching (at least all that were not German anyway) and make it 1-0. The West German captain, Manfred Kaltz, then strode forward and made it 1-1. Next up were Manuel Amoros, 2-1, then Paul Breitner to make it 2-2, before Dominique Rocheteau put the French back in front 3-2. Real Madrid's German forward Uli Stielike was next to make the walk from the centre circle, fresh from being voted the best foreign player in the Spanish league that season. 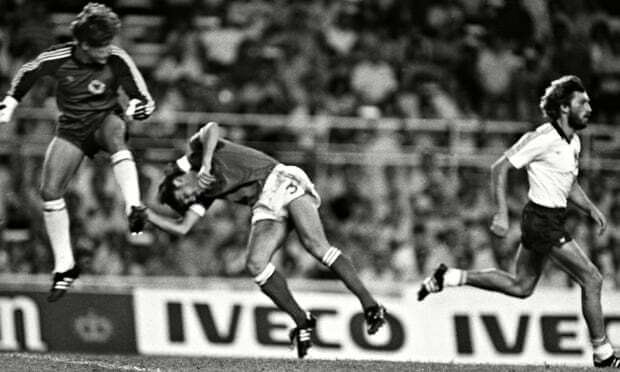 It did not help Stielike score and he missed to leave the score 3-2 to France while Stielike sunk to his knees in despair. Sparing a quick moment to console Stielike, Schumacher prepared to face Didier Six, knowing he needed a save to keep the West Germans in the game. The villain became a hero to the Germans, but even more of a villain to everyone else, as he saved Six's penalty to give Pierre Littbarski the chance to tie up the scores. Littbarski made no mistake and it was 3-3. Platini made no mistake to put the French back in front at 4-3 before Rummenigge tied it again and sent it into sudden death. Schumacher once more saved, this time from Maxime Bossis, to leave it all on Horst Hrubesh shoulders, who won the tie for the West Germans. Schumacher, the goalkeeper who should have been sat in the dressing room, was instead the difference between the two sides with his two penalty saves knocking France out. After the game Schumacher caused even more controversy when interviewed and told Battiston had lost two front teeth he said: "If that's all that's wrong, tell him I'll pay for the crowns." The German manager, Jupp Derwall, tried to stick up for him man by saying Schumacher told him he went for the ball and it was an accident, but no one believed him. L'Equipe's front page carried a picture of Schumacher's hip making contact with Battiston's jaw and contained the line: "A story of unpunished violence....Schumacher was a brute." One French newspaper ran a poll for the least popular German in France, Schumacher won by a landslide, with a certain Adolf Hitler a distant second! Anti-German feeling was rampant, with switchboards to media outlets jammed by anti-German calls and cars with German number plates parked in French campsites having their tyres slashed and windows broken. The atmosphere between the two countries was becoming poisonous and German Chancellor Helmut Schmidt tried his best to calm matter by sending an open letter of condolence to French President Francois Mitterand, which read: "Our hearts go out to the French, who deserved to go through just as much as the Germans." No one cared about the Germans comeback from 3-1 down in extra time, that one moment overshadowed everything. It certainly overshadowed Battiston's World Cup as the French defender suffered with cervical pain for the rest of his life, to add to a cracked vertebrae and broken teeth. He certainly never accepted Schumacher's explanation at the time, remembering later that Schumacher had looked highly strung to him when he was watching from the bench before coming on: "I remember his attitude even when I was sitting on the substitutes' bench. I observed his behaviour, the way he clashed with Dominique Rocheteau and Didier Six. I thought he was very hyped up, very excitable. I remarked on this to the other players on the bench." Justice was (sort of) done in the final, when the Italians beat Germany, with Schumacher refusing to shake hands with the Italian president Sandro Pertini following the game. It was decided after the game that Schumacher should go to France to apologise to Battiston in person. Schumacher went to Metz, the day before Battiston's wedding, and met with Battiston, handing him an FC Koln pendant and an apology. Battiston felt that the apology was insincere. A press conference was hastily arranged with the pair sitting next to each other. Unfortunately pictures showed them looking in opposite directions, looking like neither man wanted to be there. Schumacher cut the conference short, objecting to questions from the French press saying: "This is something that concerns only Battiston and me. If I had known, I would have brought my own German journalists with me." It had really not gone well at all, with even German mag Kicker reporting: "Schumacher forgets himself. It was a gesture of reconciliation with unpleasant consequences." While Le Figaro wrote: "The bad guy just wanted to poke fun at the good guy." French president Mitterand mulled over getting Hidalgo to get his players to publicly state they had no problem with Schumacher. Hidalgo responded: "What, shall I ask them to take the Germans on holiday with them?" Alain Giresse - to visit the Padirac Cave. Michel Platini - to climb the Grandes Jorasses mountains. Maxime Bossis - to scale the heights of the Vallee Blanche. Dominique Rocheteau - to watch a sunset from the cliffs of Etretat. Marius Tresor - to do a parachute jump with a delayed opening. Patrick Battiston - to help me pick mushrooms in the forest as I still can't bend down. The last one is particularly poignant as Battiston never truly recovered from the incident. 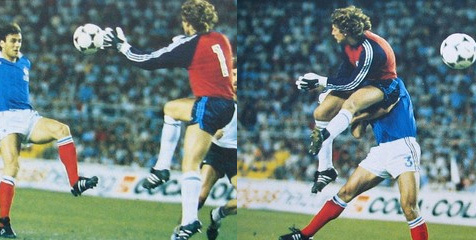 The West Germans and French faced each other in a friendly in 1984, bringing Battiston and Schumacher once more face to face. Prior to kick off, Schumacher presented Battiston with his jersey but Battiston can not even remember what he did with it or even if he still has it. However the incident did have one unintended result for the good, according to a lot of people. There is a school of thought that the incident brought the French together behind the team, which helped them to win the 1984 Euros. 1986 saw Schumacher save 2 of 3 penalties in a shootout against Mexico in a World Cup quarter final to take Germany through to face France in the semis once more. Fate threw the two together again, with both players in their respective teams. Schumacher tried to avoid talking about the incident but Battiston did say before the game that it was "forgiven and forgotten". Though not that forgotten as he also said he was wary of getting "close to Schumacher" and that he would stay at least 40 yards away! Germany went through 2-0, to a final they lost once more. You would think after all this Schumacher would want to keep his head down and see out his career a West German hero but a French villain, but not him. Instead he managed to make himself a villain in both countries with the release of his autobiography Anpfiff, though not for his version of the Battiston incident. He did continue to claim it was not a foul and he also said that he did not check on Battiston's wellbeing on the pitch because several French players were making threatening gestures in his direction: "It was cowardice. Perhaps it was the first moment in my life when I was a real coward." One thing is for sure, Schumacher was certainly not a coward when it came to his autobiography which caused a massive scandal in Germany and led to him being forced out of Koln after the revealed a massive use of doping in German football. He also claimed that the national team had an army of doctors accompanying to to Mexico for the '86 World Cup, where players were given cough syrup laced with ephedrine, litres of drinks which caused some dysentery within the squad and sweets stuffed with supplements. Schumacher also revealed that his team-mates were heavy users of prostitutes. Since then, he has gradually been forgiven, working as a keeper coach at Koln, Fenerbahce, Bayern Munich and Borussia Dortmund and managed Koln for a period in the late 1990s. Schumacher is now vice-president at his beloved 1. FC Koln. Even Battiston has moved on, saying recently: "I have forgiven. Over time I have come to realise people have forever marked him with this." It is such a shame that a career that should be remembered for being amongst the best in the world is instead remembered for the controversies which overshadowed two World Cup semi-finals and then ended his career prematurely as a player. To read the previous episode in the Sporting Villains series, Spains Paralympics Basketball Team 2000, click here.